No one knew the truck driver had a dog; in fact, to the best of everyone’s knowledge, he didn’t even have a cat to deal with the mice that seem to love Texas. Shovel in hand, our good Samaritan spotted something when she walked past a dilapidated kennel. Almost buried in ice, she found an emaciated dog frozen to the ground. Literally - frozen to the ground. She somehow managed to break the dog loose from the ice, wrapped the frozen body in her jacket and raced home. It took over two hours to thaw out the body enough for the most feeble of movements. The dog was breathing – but barely. A plea for rescue was put out and I raced over to help. While trying desperately to revive the pup, the young woman named her Hope. Gently and urgently we loaded Hope into my car and drove far too fast to my vet. I hovered over the now semi-conscious dog as the vet poked and prodded then sadly said that Hope had the worst case of worms she had ever seen. And she’s been a practicing vet for years. Starvation, dehydration, diarrhea and heaven’s know what else had ravaged her body. IVs, warmth, medications and around the clock monitoring for five days – and I brought Hope home. She was heart worm positive; a little over a year old, weighed 25 pounds (some of which were thanks to the vet’s care) and abused beyond the most vivid imagination. Hope had to be treated for HW but needed to both gain strength and weight before she could undergo treatment. A week after I brought her home, a week closer to Christmas, Hope could barely breathe. Back to the vet we raced. She had thrown a clot and had a pulmonary embolism. The vet said it was all over. Holding Hope’s too light body in my arms I asked if there was any hope – any chance – she could pull through. Tears running down both our faces the vet said there was an exceedingly slim chance. I brought Hope home to give her as much comfort as possible – for the first time in her short life – before it was time to let her go. Sitting with Hope’s head in my lap I got hold of an herbalist rescuer friend who gave me a list of herbs, detailed instructions and an instant novice’s education in what herb does what. After a month of herbs and cuddles Hope was breathing comfortably. Six weeks after beginning the herb regime our visit to the vet brought tears of joy. The clot had dissolved totally. Hope now weighed 50 pounds. Seven weeks after being chopped out of the frozen ice there was truly hope that Hope would make it. She would have a delayed puppyhood … but she would have one. Another four weeks and Hope went for her first HW treatment. Her lungs filled up. I brought her home and prayed. The vet prayed. Everyone who knew Hope’s story prayed. A month later, Hope went back for second and final HW shot. She breezed through it and is completely heart worm free as I write. Today Hope is a beautiful, healthy and spoiled little miracle and a tad overweight. She might never outgrow her much delayed puppyhood. Something that is just fine with me! With her optimistic and happy nature Hope has become my rehabilitation dog for foster dogs that are terrified of human contact. She manages to instill trust not only in herself but also trust in people to our foster rescues that are frozen in fright or curled into cowering tight balls. I’ve lived this Hope miracle more than a few times. And there are countless dogs she has taught “people can be good” that are now in their forever homes. Is Hope a miracle dog? You better believe it! 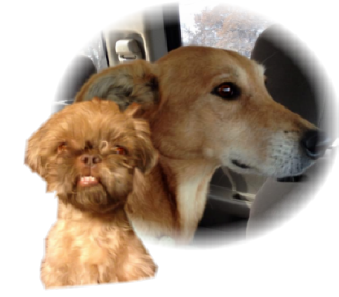 Every dog in our madcap household - permanent residents and fosters alike - have brought a wealth of joy and knowledge. Chewy was my first rescue dog and he won my heart in an all-consuming way. When I found Chewy he was on a three day stay hold in the shelter and he was in a terrible state. Almost hairless; a horrific eye ulcer, skin and bones and terrified. The three day stay hold meant I couldn’t get him to the vet for three days and the shelter was totally unable to give him the urgent medical care he needed. For those three long days I prayed he would make it. Just a few more hours; please give him just a few more hours God … that was my litany for 72 hours. When I could take him home we went on a regime of gaining weight and learning to trust. What none of us realized was that his weakened body wasn’t capable of building the titers needed to work with the vaccine to keep distemper off the agenda. Chewy’s Hope was born that day. It is with great sadness we share the passing of Hope. 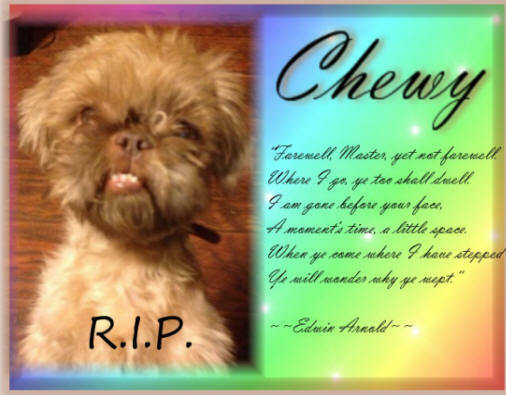 She was one the inspirations for the founding of Chewy's Hope. 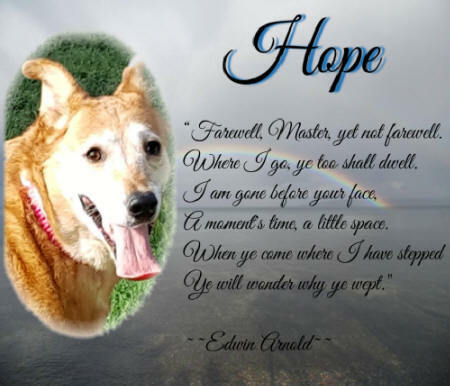 While she Rests In Peace, she will always be loved and remembered as our namesake of the Rescue. 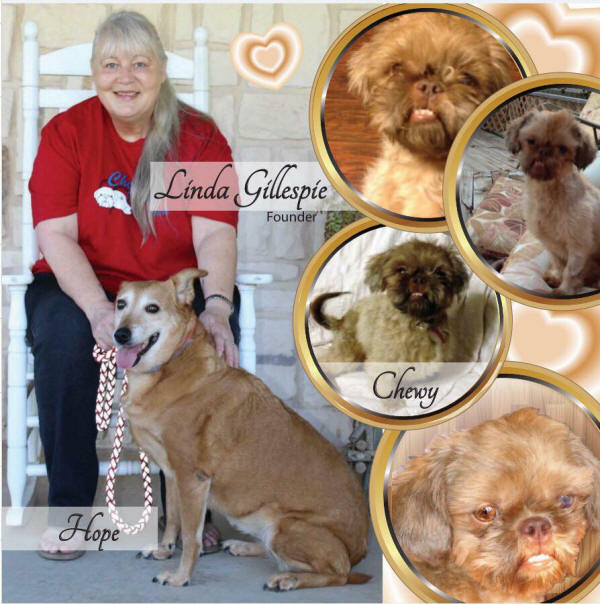 Our condolences to Linda Linda Jennings Gillespie and Herald in their loss of such a truly inspirational spirit.